I just ran into the kitchen and threw out my old pizza cutter. Why? Not because I’m done with pizza; that day will never come. But because this Star Wars inspired BB-8 Pizza Cutter is available to order on Amazon. 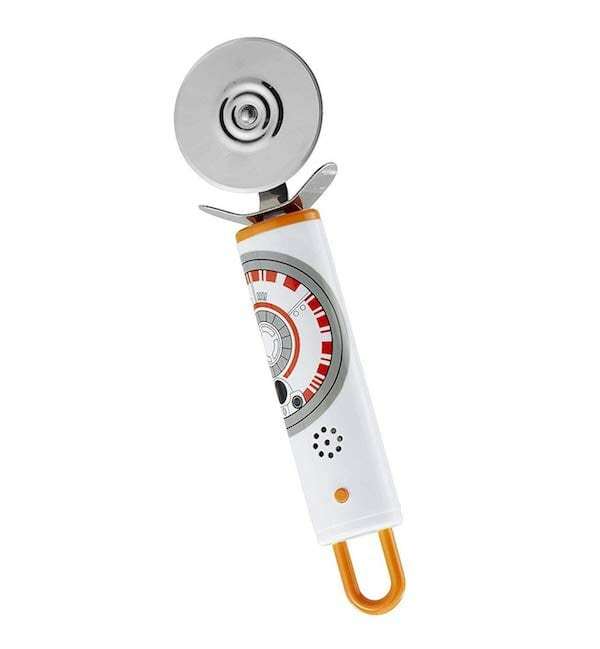 This officially licensed product is 9″ tall and features a steel cutting blade and durable plastic handle while also serving up a slice of fun with some great droid sound effects. BB-8 is a spherical robot with a free-moving domed head… …..He is white, with orange and silver accents and a black optical lens on its headpiece……..BB-8 possesses multiple panels containing various tools and ports………BB-8 has a very important mission that he must accomplish and so he uses his personality, his coyness, and all his resources to accomplish his missions……..Now you can cut your pizza in true droid style with this functional, Officially Licensed Star Wars pizza cutter………… As your press and cut through your pizza, the BB-8 pizza cutter will make movie themed noises and sounds from Star Wars: The Force Awakens.